The newest edition of the Illinois School Law Survey, authored by school attorney Brian A. Braun, has been published by the Illinois Association of School Boards. The book, published every other year since 1990, is an easy-to-use legal reference to common school law questions and issues, written in a Q&A format that can be used by school board members, administrators, secretaries, and attorneys. Answers in each of the 27 chapters are based on state and federal statutes and case law in force and reported as of Jan. 1, 2016, and administrative rules and regulations current as of Dec. 15, 2015. The 14th edition includes new questions and answers that have been updated and/or expanded and others that have been revised in some fashion. That’s in addition to new court decisions that alter the application of existing laws. Court cases are compiled in a table in alphabetical order by name of plaintiff. Each court decision is listed in the table with full legal citations and a note as to where the decision is referenced in the book. In addition, the newest edition puts the entire contents of the book and its resources online. Each book provides a unique user access code that replaces the CD found in older editions of the book. This digital version can be accessed on any computer or mobile device (laptop, tablet, or smart phone) with Internet access. 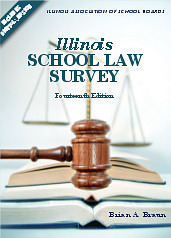 The Illinois School Law Survey may be obtained from IASB for $60 (IASB members pay $45) plus $7 per order for shipping. Additional work station licenses are available for $7. 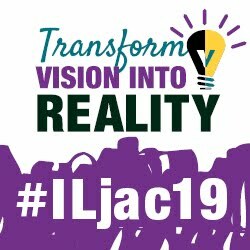 To place orders, call IASB at 217/528-9688, extension 1108; mail or fax a printed order form; or visit the IASB bookstore and order online.